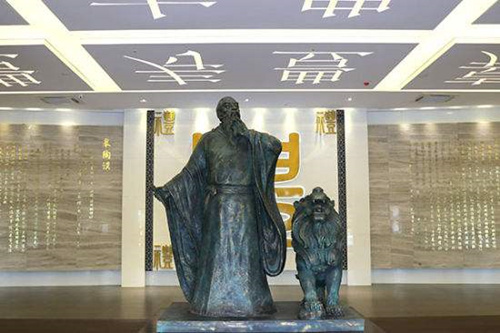 These sculptures depict Gao Yao, one of the legendary sages respected by Confucius, and Xiezhi, the symbol of law and justice. Gao is the founder of the ancient Chinese justice system and one of the first advocates of the theory of rule of virtue. Most dynasties in Chinese history that had the ability as well as the willingness to venerate the code of ethics and respect the rule of law, adopting the joint governance of law and virtue, were characterized by stable governance and steady development. One might say that the culture of joint governance by virtue and law is the legacy of traditional Chinese legal culture. President Xi Jinping said the rule of law cannot be separated from governing by virtue, and neither can be emphasized at the expense of the other. He stressed that state governance demands the coordination between law and virtue. Historically speaking, the concept of rule of law in the theory of joint rule of virtue and law in ancient Chinese culture refers to the one advocated by the school of Legalism. However, the rule of law in socialism with Chinese characteristics cannot be realized without the judgment and support of virtue as well. Rule of law in modern China requires virtue to guide values and provide instrumental support. The idea of the rule of virtue is a significant part of excellent traditional Chinese culture. When exploring detailed ways to integrate rule of law with the rule of virtue, we should absorb the quintessence of the idea of rule of virtue, and properly transform and innovate it. The idea of rule of law stresses the authority of law and people’s obedience to law. The laws commonly obeyed by people should be the ones well crafted. Then, what are the basis and reasons for people to obey the laws imposed on them? How can we judge whether a law is good? In fact, all these are questions about the legitimacy of the law as in the rule of “law.” However, these questions cannot be answered by the rule of law theory alone but rather by other theories as well. The laws are legitimate not only because they are made and promulgated according to prescribed procedure and authority but also because they are in accordance with the demands of “virtue,” which people recognize, uphold and embrace. The standard of virtue in Confucian philosophy is multilayered and composite. At the same time, it is logically consistent. The concept of “making one’s virtue conform to Heaven’s will” requires a ruler to be a man of integrity and good virtue. It is a requirement of divine legitimacy to obey nature, care about the wishes of the public, respect nature and protect the people. Virtuous or benevolent governance requires rulers to reduce criminal penalties and taxes, establish a people-oriented political system, and rule for the benefit of the people. Rulers should make practical contributions to serve the interests and demands of the masses, which lays the foundation for legitimacy of being in accordance with the public will. Nourishing the nation requires rulers to develop culture and education, and to cultivate personal virtues. And cultural legitimacy requires the rulers to inherit and update Chinese history and culture. The balancing of this three-tiered legitimacy of divine mandate, public will and culture may prevent an emphasis on any one at the expense of the other two during the political and legal function, which embodies the Doctrine of Mean in Chinese culture. The aforementioned standard of virtue stresses the will of people, demanding political and legal activities to satisfy people’s selfish desires and utilitarian purposes. However, sublime moral pursuits, great cultural ideals and the overall and long-range interests of the nation and the people also should be safeguarded by politics and law. By absorbing traditional virtue standard and providing modern Chinese theory of rule of law with legitimacy, we may correct the deviation of the rule of law in modern China. The rule of law, the most reliable protection of personal interest and social order, is the fundamental strategy by which a modern nation is governed. However, modern law, to some extent, does not change the heart of an individual. A man is not simply a life with material desires, but also needs beliefs, culture and a spirit. Laws, however sophisticated, cannot constrain a man who is deviant in his heart. A nation or a people without a stable dominant culture or belief will be unstable or even fall apart. The rule of virtue, above all, deals with the problems of body, mind and life, including how to improve social morality. Combining the rule of virtue with the rule of law— pacifying people’s bodies and minds with virtue while regulating their actions with laws—is a fundamental way to address all these issues. Virtue in traditional Chinese culture is posited to be an intrinsic or transcendental principle for making and judging political actions and laws. Virtue requires an individual to unite his desires and interests with others, the community and nature. One should pursue harmonious coexistence rather than opposition and confrontation with others. In addition, traditional Chinese philosophers thought that rule of virtue pacifies people’s bodies and minds not through obedience to gods but through adherence to humanistic philosophies. There is a consistent philosophical logic in addressing issues ranging from nourishing one’s moral sense and arranging political order. The ways and reasons to cultivate oneself, regulate a family, govern a nation and pacify the world all can be found in the theory of virtue, which emphasizes winning people’s respect through reason and virtue. This system of humanistic philosophy is benevolent, peaceful and rational. Eliminating the arbitrariness of law, which includes uncertainty, instability, vagueness and internal conflicts, requires the law to have its own internal moralities. However, the rule of law itself cannot determine what can be included into laws. Preventing bad laws in the practice of rule of law requires other forces beyond the rule of law in which traditional thought of rule of virtue may find a role to play. In addition, the form of rule of law has its own insurmountable internal contradictions, which may be relieved by combining the rule of virtue. On the one hand, law needs to be clear and concrete, limiting official discretion and ensuring impartiality. Meanwhile, law should stay stable so that people may anticipate the results of their actions. On the other hand, social life constantly changes while the legislators have limited rational power. And the rule of law requires law to be elastic and able to adjust to the changes in social life, eliminating the ossification of legal application. However, satisfying both these needs is impossible within the framework of rule of law. The rule of virtue, however, emphasizes the role that people play in a system, granting a person of virtue more discretion within the system and trusting the experience, wisdom and virtue of a virtuous person. Within the framework of rule of virtue, the ossification of rules is addressed by an individual, and good social order is fostered by relying on moral authority. The loopholes of the system may be filled by the men of virtue, and the efficient operation of these rules may be improved.